I was 22 years old and familiar with computers, having one since my step-father gave my brother and I what was easily among the very best Christmas presents ever: An Apple IIe w/128Kb of RAM and an external floppy drive. I rode that system for six years and loved every minute of the games and programming experiments it made possible. That experience helped me justify eventually saving up for a PC of my own at the age of 21, soon trying every network service in existence from Compuserv to AOL and the local dial-up Bulletin Board Services (BBSs). I was looking for a job when in the paper I saw a small ad that caught my eye. 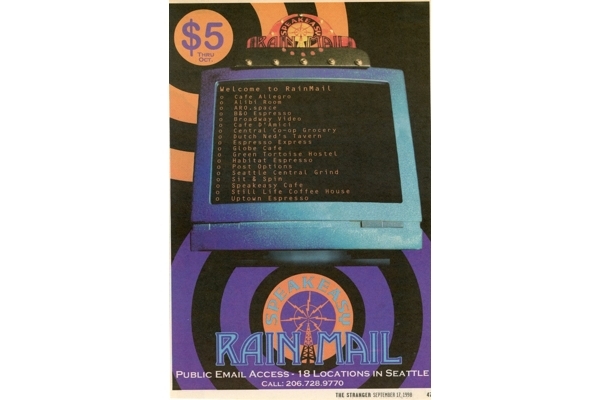 It was for a service called 'Cyberspace' and that led me to securing a job with the company one floor above them in a building on Queen Anne. Before long I had convinced Cyberspace's SysAdmin that drilling a hole in the ceiling to drop me an Ethernet cable was actually a splendid idea! Soon, I experienced 1.5Mb T1 -- and, coming from just 56K modem-land, I was hooked. Oddly, the first time I heard someone say 'Internet' I felt instinctually I knew what it was -- I'd imagined the 'walled garden' services and what they could be. I think it was partially so familiar to me because of the hopes I had already dared to have, natural at that age where certain ideals (and ideas) begin if they haven't already, to inform your aspirations for the world around you. I held both then and now certain principles, such as the freedom of information and that everyone should get enough to eat, live in reasonable comfort and peace -- primarily so that they may pursue a lifelong education and know the joy of building relationships with their family, friends, and community. Certainly it was due to my personal situation that I felt strongly about open access to knowledge as a means to self-educate and benefit from the knowledge and wisdom of my fellow human beings. 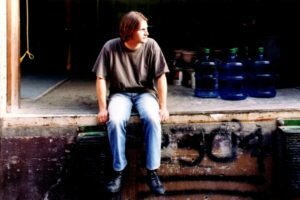 By the time I founded the Speakeasy Cafe at the age of 25, I had developed a considerably more comprehensive understanding of the Internet, its history, how it worked at that time, and the potential it had to become in the future. There is no question that the awe-inspiring, planet-altering potential it held was the main thing driving me to start that business -- not money, not fame, but this terrific passion I simply found I had doing whatever I could to help ensure people experienced and saw what I saw: Something that could change the world fundamentally and in almost every way. It was this conviction that led me to feel certain that it wasn't a matter of persuading people to see this promise, I knew that was an automatic if they could just get online at high-speed. That's why Speakeasy arranged to dig up the alley and install a T1 line at a cost of $1500/month and connected directly to the area's only Internet authority, Northwest Net. Tony Naughton, who eventually went on to become the CEO of InterNAP, personally came and visited us at the construction site, long before we opened. With the founding of the Cafe, I began my 20 year journey that went from opening the world's first internet cafe to launching the country's first independent broadband network to developing and providing software that promotes transparency in advertising. 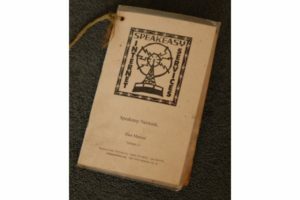 Included below are the original mission and vision documents that I shared with Speakeasy's original founding members. The idea of computers at a cafe is one possible answer to an increasingly pressing question: How to provide the general public access to the methods of communication and volumes of information now available on the Information Super-Highway, at a cost they can afford and in such a way that they aren't socially, economically, or politically isolated. The goal is to provide a service that is not simply entertaining, but educational, enlightening, and most of all empowering. 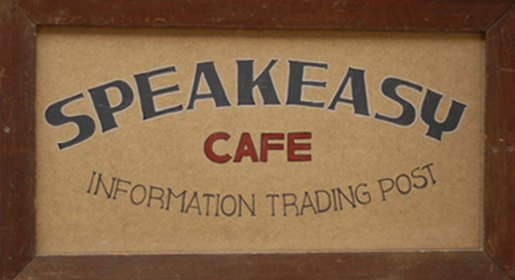 The Speakeasy will strive to set the tone at the cutting edge of localized on-line information technologies. Our emphasis on Seattle and the Puget Sound region linked with a network of over 20 millions users will bring new definitions to our idea of community. We will feature on-line databases on a wide variety of local issues, social, political, consumer education, even libraries designed and maintained by each individual user, the subject areas are endless. 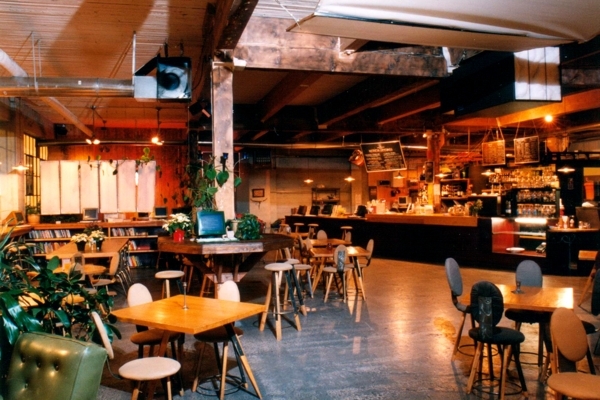 Email and a Seattle event databases will be a free service to patrons at the cafe. The Speakeasy staff will assist individuals in independent news-gathering, research projects, and provide them with a set of tools in order to build entirely new facilities on-line. Rather than embracing the technology simply, we will seek to utilize and define avenues through which it can be applied for the benefit of every individual. While we plan to adopt new technologies, develop and refine interface programs, and expand our facilities, we will constantly be analyzing the impact and results of our policies to determine whether or not we are meeting our goal of constantly improving service while maintaining a reasonable cost-of-access. We are also concerned and will work to cooperate with companies and entities interested in maintaining the public nature of the internet. The first half of the twentieth century brought radio and television, two mediums that are regulated and accessed via specific definable resources, by both the sender and receiver. For instance, radio and television have specific spectrums of frequencies allotted to them, the internet by comparison has a broad spectrum of bandwidth with which to allow a platform of nearly open access. As we move into the 21st Century, this country and the world is having to reevaluate the nature and implications of the resources we have available to communicate. We must learn to allocate them in a manner that does not discriminate or alienate any portion of the population. Speakeasy incorporated consists of seven shareholders in a privately held sub-chapter S corporation. We have five board of directors who are elected through the shareholders in a two-three rotation yearly. The officers are: Mike Apgar, President; Sam Foucault, Vice-President; Lou Torregrossa, Secretary; Gretchen Apgar, General Manager; Mike Apgar, Treasurer. The Speakeasy project has gained the participation and interest of several individuals and organizations. To date we have gained the services of persons in these areas of expertise: architecture, construction and contractual law, building construction, interior design, computer programming and operation, theater and music production, a media analysis, marketing, and several other areas including general business consultants. We're always looking for people with other skills or interests to join our team. We also have occasional volunteer positions open so, if you want to get involved and you're not sure how you could help, drop by the cafe. 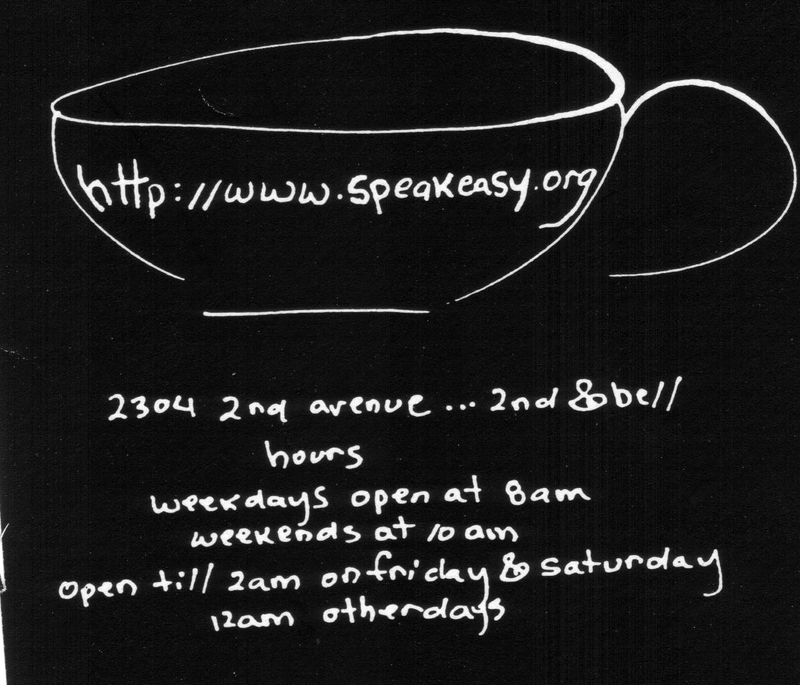 The Speakeasy Cafe will be based in Belltown, a neighborhood of downtown Seattle, Washington. With over 5500 sq. ft. of space, it is a location that will not only put us a community in which to base ourselves but provides us the space we will need for our many backroom events. These include films, live music, spoken word, guest speakers, community meetings and Internet events. 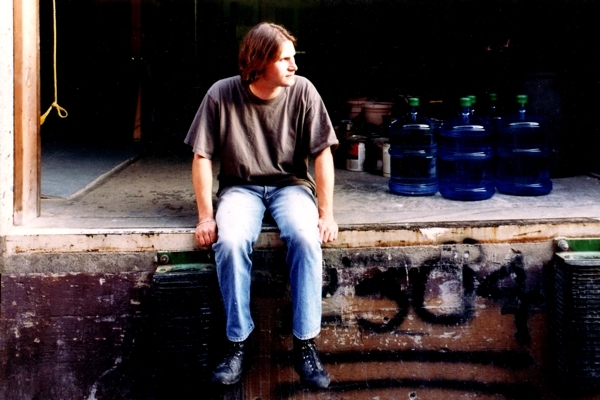 As of the first of the year, 1995, The Speakeasy has five identifiable projects in the works. These are explained in detail on the following pages. They are: Dial-up Internet Service, Remote Access Terminal Service, the IBAG project, and the Atlantis MUD/MOO, and the Cafe itself. The Atlantis Project is intended to guide the Speakeasy towards an on-line interface for our members that access the Internet portion of our services. We should work towards an on-line environment that simulates a functioning society. One such suggestion has focused on the idea of "Atlantis" being the name of our on-line "world" or service. We would like to see a MOO-like environment where people can interact socially, manipulate objects while "in" the MOO (whether those objects are email, files, graphics, etc.). While not all members would appreciate this front-end to our system it will serve a large number of people an opportunity to be involved with the Speakeasy on a very direct level. We will offer an additional interface that has access to virtually all of the same information and services through standard applications. We are developing a truly graphical MOO. Something similar to the computer game "Myst" in it's interactive style. One functional possibility is providing our users with a CD just as is provided in computer games, we would maintain the bulk of the data certainly ALL of the graphics files at the clients site. This would eliminate having to transmit that information across the telephone line connection. We would merely send a message to their computer (which would obviously be running our application) and say something like "display courtyard - view 3" or "display user_id living room". Through quarterly, or perhaps monthly updates we could update the clients CD with the graphics that will be constantly added by the users themselves. For instance, when a user updates a graphic in the MOO it would have to be given to the other users. The Speakeasy would distribute this change onto the CD for a nominal fee or perhaps as part of the membership charge. We will also include a feature that would allow minor updates to take place through on-line downloads that would be linked into the client's application. Getting out of that muck of details for a moment and focusing some of the features of Atlantis, we would like to have libraries, shops, parks, public-assistance centers and so on available in Atlantis. Users that specialize in say, fly fishing would open a fly fishing clinic. The population of Atlantis would be able to go to that clinic on-line and be able to consult with the proprietor of that shop - directly if he/she/it is willing and on-line or through email or perhaps a bulletin board type system. Furthermore, the owner of that shop would be expected to complete a public-domain FAQ on his/her/its chosen shop subject. These FAQ's would be added to the library and be bundled into an area called "Handbooks for Humans" or some such terrific name. The library would hold a wide variety of information through WWW links to various document and graphics servers around the net. Internet in a Burlap Sack is intended to provide a easy GUI install version of a package of shareware programs designed to enable a person to connect via PPP/SLIP to their Internet provider. 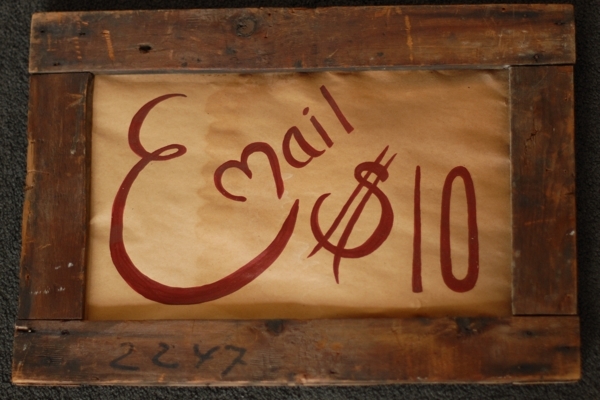 The package will feature programs that will manage and facilitate the use of: Email, Usenet, Gopher, FTP, and the WWW. The initial offering of this project will be similar to shareware in pricing, we are targeting $14.95 per unit. The entire package will be bundled together with a "hardcard" that will detail specific UNIX commands, define some of the vocabulary a user will find on-line and in associated media, and explain how to find an Internet provider. The package will consist of two IBM-compatible HD disk, one "hardcard" and a comprehensive help file. This file will aid in configuration, walking a user through each application in detail. These items will then in turn be packaged in a small burlap sack, cinched with a hunk of jute twine and a Speakeasy card (similar to our business card but w/ "IBAG" in the center and "Internet in a Burlap Sack" along the bottom") affixed by the twine to the top of the bag. 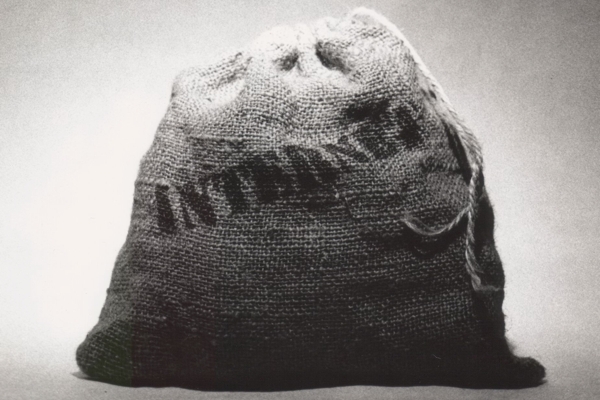 The word "Internet" will be stenciled on the bag with spray paint, probably red or black. The package is generic in terms of provider information but we will provide a customized version for customers of the Speakeasy. The Speakeasy version will be fully supported. The generic package will rely on the support from the individual program designers. 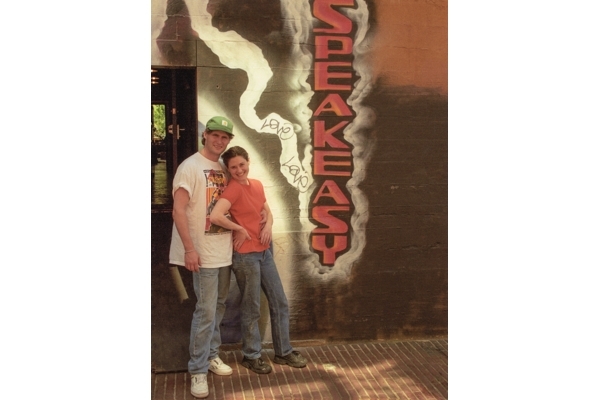 One major goal of the Speakeasy for 1995 is to develop and implement a remote access service. This service will enable persons without computers and home to access the Internet from terminals in several areas of the city. 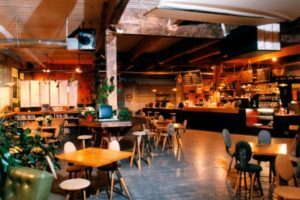 Working with cafes, bookstores, arcades and so forth, the Speakeasy will install and maintain computers at remote locations that have direct links into our service. Members will be able to check their email, consult the Seattle On-line Entertainment Guide, and participate in IRC. We will make half-price memberships available to those who want only remote access services. Verification will be made through login I.D. attributes. New or renewing members may sign up through the Cafe, or at the site providing the terminal. Users will be encouraged to limit their access to 30 minutes at these remote sites especially if others are waiting to use them. With enough terminals spread throughout Seattle and the region, we should be able to provide a new form of communication to individuals in Puget Sound. Properly employed, this service will rival voice-mail as a messaging medium. Further implementations of this service are planned for the latter half of 1995. We would like to see each community of Seattle have their own area on-line that will serve as a bulletin board and "common area" to the people living there. People could post messages about garage sales, ride-sharing/carpools, community issues and so on. Commercial posting, as with all areas of the Speakeasy Network, is strictly restricted. (Allowances are made in defined areas of the Atlantis MOO by permission only.) At no time and in no way will "in-line" advertisements or allusions be allowed. In order to maintain the integrity of the community network this policy will be rigorously enforced. Basically anything else goes! The intention of the Speakeasy Network is to provide a broad level of access to the Internet to any person regardless of their RL manifestation. What this means is anyone can get onto the Speakeasy Network. We have membership plans, low-income and senior rates, specific programs of free-access and structured mechanism to re-publish information through printed media. The dial-up access portion of the Speakeasy Network is simply defined as: The latest in technology, the best modem to user ratio, excellent customer service, redundant systems, and innovative user interfaces. We will further be providing specific events on the Network designed to assist communities and organizations in their endeavors. Independent journalists and researchers will be provided supplemental programs of assistance. We will provide modems with the highest speed currently available. The system will be power initially by a Sunsparcstation with rapid upgrades implemented when system load requires. Our initial pipe to the Internet will be through a T1 (1.544 Megs/Sec bandwidth). The Speakeasy intends to be at the forefront of efforts to maintain the integrity of the Internet. Through efforts in government and the public domain we hope to secure the Internet as the one peace dividend we've heard so much about. We believe the Internet and the World Wide Web provide a new level of communication and information that offers a level of empowerment previously impossible in any socio-political system. This means empowerment to the individual and enables new levels of involvement in this, our predicament. We will at all times maintain a policy of freedom of speech for all, regardless of their political or moral beliefs. Solutions come from freedom to communicate and discuss, not from exclusion, economic intimidation, moral indignation, or the manipulation of the few channels of communication the current media provides. To the commercialization of on-line services and orchestrated attempts to extend that scepter of maximizing the contrast between the smallest of differences in order to paint a picture of scarcity and consequently arbitrarily raise the price of access, we do not subscribe. Don't worry, we're not kidding. Like the Cafes of Europe in the earlier part of this century, The Speakeasy will be a place for conversation, and discussion, and entertainment.The Cafe will feature several terminals that will offer free email service to our clientele. An on-line Seattle "what's happening" guide will also be available at no cost. We will also be providing several terminals that will feature common word processing, design and layout, spreadsheet, and other applications. This will be coupled with a scanner, high quality BW and color printers, and copy machines. We will also have services such as binding, research assistance, and reduced rates for organizations such as bands and theaters to produce informational flyers at reduced rates. Several other terminals will feature full Internet Access and all of the associated applications such as Mosaic and Email. We will specialize in custom interfaces for our users, allowing people to setup their own areas and databases. This will be largely based around our Atlantis MOO. Our backroom, will open April 1st, possibly under the name "The Wasteland". We will feature young Jazz, Blues, and RR with an "unplugged" feel. We will also feature movies, spoken word, and Network events in this space. Any inquiries regarding booking or reserving this space should be directed to him. The Cafe will have an atmosphere of casual, a kind of living room feel. Anyone is welcome and can stay as long as they like (no overnighters though, sorry). It's been said we are in the midst of an "information revolution". We believe it's only just begun and as the line goes "The best business to be in during a revolution is a cafe".